The olive ridley is the most numerous of all the sea turtle species and is a medium-sized species of sea turtle found mainly in the warm and tropical waters, primarily in the Pacific and Indian Oceans. 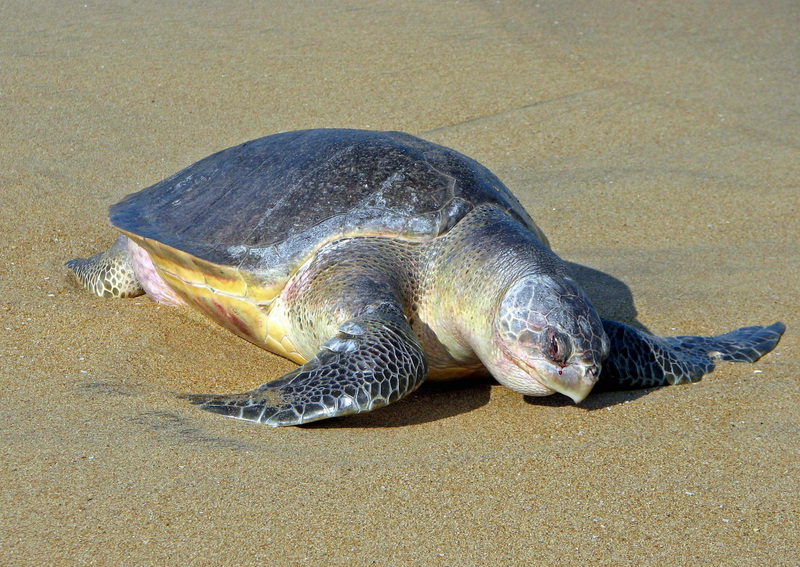 It is named for its olive green colored shell, which in shape is very similar to the Kemp’s ridley sea turtle. but with a slightly smaller head and a deeper disk-shaped shell. Olive ridleys, like the Kemps, nest every year in arribadas. However, these arribadas occur at night on a 28-day lunar, unlike the daytime arribadas of the Kemp’s ridley. The arribadas of this species are almost smaller, then their cousins, usually only involving around 1,000 nesting females at a time. Females will nest 2 times each season and lays an average of 105 eggs in each nest. 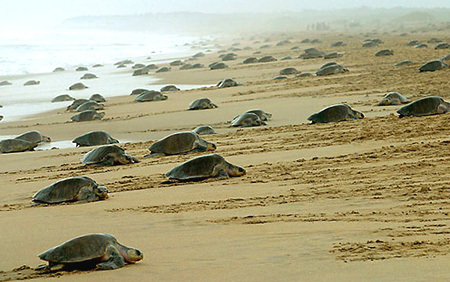 The two popular nesting beaches for Olive ridleys are Ostional and Playa Grande in Costa Rica. The Olive Ridley has many known natural predators. As eggs the main threats are from land animals like raccoons, coyotes, feral dogs and pigs, opossums, ghost crabs, and snakes. Hatchlings are preyed upon as they travel across the beach to the water by bird, crabs, and raccoons. Adults they have few natural predators, but boat strikes and inadvertent submersion or capturing in ocean fishing gear do negatively impact the overall population Oddly enough, the greatest single cause of olive ridley egg loss results from arribadas, in which the density of nesting females is so high, previously laid nests are inadvertently dug up and destroyed by other nesting females.